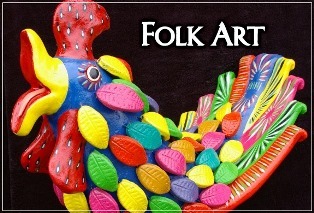 Folk art is a window on cultural expression. From the materials used to its execution, every aspect reveals the lifestyle, environment, and world view of the artist and his people. Often, folk art is an embellishment on utilitarian items, though some pieces are merely decorative, made for no other purpose than to be pleasing to the eye. Folk artists are generally untrained in the formal sense, but may have spent years learning and observing techniques from friends and family members. Masters of the art demonstrate superior levels of craftsmanship and creativity, often introducing new materials and innovations that express both traditional and contemporary imagery and values. In this way, traditional folk art forms evolve as dynamic living traditions. Across the genre, folk art allows human beings to look upon themselves - and maybe laugh just a little bit.